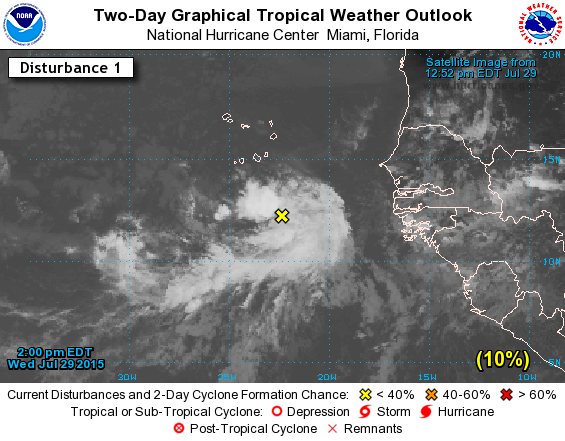 While West African tropical waves continue to propagate out into the tropical North Atlantic, none are expected to develop into a tropical cyclone soon. Today, the 2:00 PM EDT NHC Two-Day Graphical Tropical Weather Outlook shows one of these waves accompanied by a broad low pressure system, which particularly looks impressive on satellite imagery (see image below). Still, environmental conditions are not too favorable for a cyclone to form. Generally, tropical waves are accompanied with areas of disturbed weather that along with other dynamics of the atmosphere (that include climatological and synoptic conditions) could lead to cyclogenesis. One of the main favorable atmospheric conditions for tropical cyclone development is sustained, deep, moist convection. However, constant and extensive episodes of Saharan Air Layer (SAL) outbreaks are disrupting the formation of a nearly-saturated middle troposphere, which has contributed to the overall weak tropical waves pattern. Below, enhancements of Meteosat satellite imagery with the TAFB surface analysis overlaid depict various tropical waves being affected by SAL outbreaks during mid July. The imagery show how the dry air (orange and yellow shades) and dust (pink shade) associated with this Saharan airmass cover a large part of the waves environment, thus acting to suppress any convection originating in the marine layer.